I chose this poster to launch the inaugeral One-Sheet Showcase for a couple reasons, first and foremost being that I'm attending a Star Trek convention this weekend. What better way to celebrate my impending 3-day festival of fanboyism (and fangirlism) than with the goofiest official film poster ever inspired by the beloved space-hoppin' franchise? Would I consider this a cool poster? No, not really. While The Voyage Home is easily the most light-hearted of the original cast's cinematic run, this one-sheet strictly sells the high-concept, fish-out-of-water comedy stuff (which, to be fair, it has no shortage of), rather than the crowd-pleasing sci-fi adventure tale elements involving a pair of humpback whales named George and Gracie. 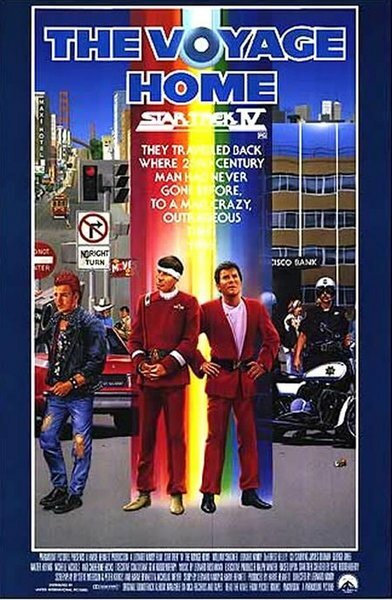 It's also hard not to childishly giggle over the fact that Spock and Kirk are beaming into San Francisco via rainbow. I imagine numerous slashfic authors hold this art up as one of their most profound inspirations. All kidding aside, though, I still have a great deal of affection for this poster. Why, you ask? Because it unabashedly promises a carefree, fun time at the movies. Take a second and try to remember some recent blockbuster lobby art, not aimed at children, which actually tried to sell the movie as being a cheerful experience. It's harder than you'd think. Nowadays, everything has to look dark, intense and - the buzz word which is driving me slowly insane - "EPIC!" Why is every franchise, no matter how good-natured and breezy (Pirates of the Caribbean or Iron Man, for example), sold on soberingly solemn images better suited to a wrenching period drama? Lighten up, people! Certainly this Star Trek IV poster has no shortage of detractors in the fan community, but I like it because it's eye-catching, colourful and unpretentious - not to mention completely devoid of irony. It genuinely makes me want to see the film being advertised. Besides, it must have worked a little bit, as Voyage Home was the highest-grossing Trek film until J.J. Abrams' awesome reboot - which also had inappropriately moody one-sheets - dropped in 2009. So while few die-hards would ever choose to own it over a vintage Wrath of Khan or Search for Spock print, I'm still greatful it made it out of Paramount's promotional department 25 years ago.